Please scroll down for my Tickled Pink Stamps Blog Hop Post! Hello! It's Release Day at Your Next Stamp, and we are celebrating with a blog hop! The hop starts today (Sunday) and ends Tuesday, March 13th at midnight (EST). Hopefully you arrived here from Wendy's Gorgeous Blog, but if you'd like to start at the beginning, then head over to Maureen's Fabulous Blog! Did somebody say prizes? The prize for this hop is the super fun Tags Galore One Set with Coordinating Die PLUS there is a secret blogger prize! To qualify, you must comment on all the blogs, then leave your name in the linky list on the Your Next Stamp Blog! While you're shopping at the YNS Store, make sure you check out the special bundle deals AND the YNS Bargain Bin! The deals in there are incredible! Now it's time to head on over to Susan's Awesome Blog! Thank you so much for stopping by and enjoy the hop! my goodness! this is so brilliant and cute! Ellie is adorable and I love your sweet little box!! 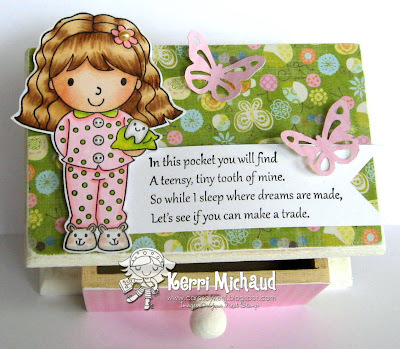 That Tooth Fairy box is the CUTEST! how cute! 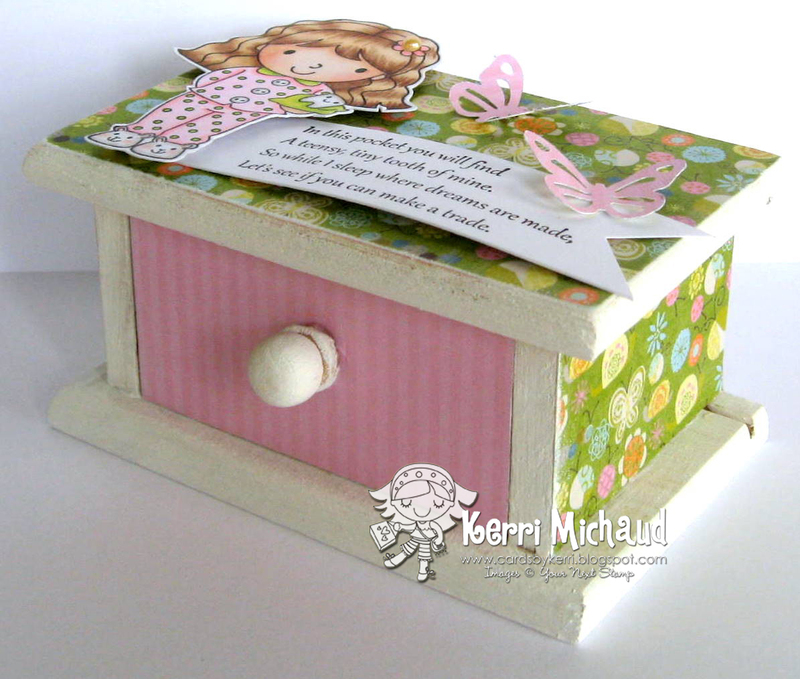 love how you used the stamp and this altered box! This is brilliant Kerri! I'm so glad Avery loves it! That totally makes me smile! Kerri...you are so talented. Love the adorable image and how you created a tooth fair box. We all know how busy the tooth fairy is and the box helps her/him to find the special tooth so quickly!Thanks for sharing with us. What a cute idea, Kerri. Love the little box and the sweet stamp. Great idea for an altered projects...and the tooth fairy stamp is wonderful. Great colours for my grandddaughter's room too! Wow, this is so cute and beautiful! Wonderful box! Wat a beautiful gift for your daughter. Very cute and great color combo for your daughter's room. What a brilliant tooth fairy you are! Love this set and your cute box. This is awesome. I love how you altered the box. I love this set...going over to purchase later today. Adorable way to save your teeth for the tooth fairy. And it is done in two fo my fave colours as well. Such a cute little box! Love it! Oh your daughter must just love this tooth fairy box! I'm sure her friends will be quite envious. So sweet! Great idea for the tooth fairy box! Lovely colors and design, too. Kerri, such a great project! Love the colours you used. Your daughter is a very lucky girl! Wow so creative! My daughter has a tooth fairy box she uses evertime but its just a jewllery box this is waaay nicer. Excellent job. what a brilliant idea to convert the box! Great idea Kerri, love the butterflies too! love this idea. Such a cute project. Love your coloring. GREAT. Love the stamp, but more so, I love the little tooth box.